For this week’s BookNotes I thought I would share this op-ed piece I had published recently in our local Sunday paper, The York Daily Record. It can be found on their online site as well. We’re grateful they published it. For what it’s worth, I want to say this at the outset: I am aware that this is a bit controversial and I am sorry if I step on anyone’s toes expressing my concern that there seems to be little Biblical basis for many of the policies of the so-called Christian right. As I say in the column, I had my fair amount of conversations with representatives of the Moral Majority and other such groups decades ago and I was consistently disappointed by the lack of solid Bible stuff to justify their policy proposals, let alone their general view of law, order, the task of the State, the meaning of justice, and so forth. There are outstanding exceptions, of course. And — again, of course! — this concern about the theological and civic merits of the religious right does not therefore necessarily imply an endorsement of other camps or views (such as the so-called Christian left.) I’ve written a number of BookNotes columns about books that might help us pursuing a coherent view of public life that is not primarily beholden to the left or the right which I wish more fellow Christians (and others) would read. For instance, see HERE and HERE or HERE. Or THIS quick summary of great titles I quickly highlighted in a recent video about books on this topic. 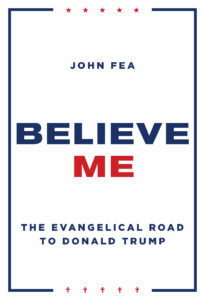 We are glad Dr. Fea is coming to the shop on Friday night (August 10th at 7:00 pm) and we hope many will come to hear him talk about his new book, Believe Me: The Evangelical Road to Trump and chat together over refreshments as we ponder the nature of the intersection of faith and public life these days. Since he is such a passionate historian, I’m sure the conversation will be informative and interesting. If you cant be here but you’d like his autograph on a book, we can get one signed for you and send it out on Monday. Just tell us if you want Dr. Fea to make it out “to” anyone particular. Autographed books make nice gifts, eh? Send us an order right away and note any instructions either at our website order form page (see below) or via email. In the 1980s, Hearts & Minds, our independent bookstore in Dallastown, hosted several events to ask if Biblical Christians should support what was then a fairly new political movement known as the religious right. We had feisty conversations, sometimes with authors or other faith leaders, about a Biblical worldview and whether such a perspective should or shouldn’t endorse the conservative wing of the Republican party. We are doing something like that again at 7:00 PM on August 10, 2018, this time hosting historian Dr. John Fea, author of Believe Me: The Evangelical Road to Donald Trump. To many church goers and non-Christians it seems incongruous. In the 1980s Rev. Jerry Falwell expertly inspired politically disinterested fundamentalists to become a major civic force, aligning themselves with the the Republican Party. I was glad, in principle, to see people of faith living out their values in the public square, making a case for their views in the marketplace of ideas, and allowing their own deepest convictions to inform their civic engagement. Religiously-motivated involvement in politics is good democracy and good religion. From some of our nation’s earliest founders to many of the modern civil rights leaders, the Christian faith has motivated and informed ordinary citizens and public leaders to care about the common good, creating a political culture that took Christ-like love for neighbor into the public sphere. “Seek the welfare of the city where God has sent you” the Old Testament prophet Jeremiah wrote centuries ago to a beleaguered group of exiled Jews living in Babylon. The righteous have always cared for their communities; thinking well about the task of the state and how social institutions can better the world has always been a vital theological task. It was wrong (and un-American) when some insisted that because Falwell and his movement were religious they should be marginalized, that their fundamentalist views were unwelcome in a democracy. No: in America, all views are viable if they motivate people to be good citizens and all are welcome to make their case in the pluralistic public square. But, oh, how wrong the Reverend got it. Supporting horrible dictators, pleading for more bombs, cutting off services to the poor, mocking those who were humble, supporting anti-American crooks like Ollie North, affirming racists in South Africa, fighting environmental protections — it was hard to find a wise position or healthy policy or a just principle behind many of his controversial Moral Majority efforts. I argued with Falwell personally about how unbiblical his views were and begged him to repent of his disregard for the vast, well thought-out Christian tradition of public theology, but to no avail. I chided him about his dishonesty when he criticized more balanced Christian thinkers saying on national TV that they were not truly Christian (as if true Christians supported war and injustice and racism.) His right-wing ground troops fighting against services to the poor, against good stewardship of the environment, against services for special needs children, against peacemaking-oriented diplomacy around the world, were all so new to politics; quickly the power-mongering went to their heads and many grew increasingly uncivil. Sadly, most simply did not know the long-standing, nuanced tradition of both Protestant and Roman Catholic social ethics. They ignored the healthy political theology written in centuries past and the robust renaissance of evangelical political thinking that attempted to be overtly Christ-like and not beholden to any party. I recall weeping in those hard Reagan years as some religious leaders worked to cut aid to the world’s starving, shamed those on food stamps, and argued for more and more money to right-wing militants in places like Nicaragua and Guatemala and lauded the US-backed assassination of Archbishop Oscar Romero in El Salvador. It nearly seemed as if many of those aligned with the religious right hadn’t read those big, black Bibles they waved as they advocated for policies that the Bible itself opposed. As much as the 1980s Christian right influenced public policies in ways that seemed to me to be inconsistent with Biblical shalom, it seems that most of the conservative evangelicals and fundamentalists who supported Falwell were at least motivated by good concerns: family values, as they were called in those days, a concern for the unborn, resistance to secularization, and a coarsening of public discourse. That question will be pondered for years to come as theologians, cultural critics, and historians reflect on this odd season of American life and this peculiar alignment of conservative religion and a prideful President who said he has never asked for forgiveness and who stands for some policies that are against the grain of Christian tradition. 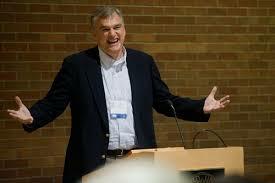 Dr. John Fea of the history department at Messiah College is one such historian who is himself an evangelical and interested in this perplexing re-run of the religious right. He has written a well-researched book called Believe Me: The Evangelical Road to Donald Trump, released by Eerdmans Publishing to much acclaim a few weeks ago. Fea has been on national talk shows and his book is being reviewed all over the country. He writes about the history of religion in American public life. His specialty is the colonial period and his earlier book, Was America Founded as a Christian Country?, has earned significant awards. In this new book he is trying to discern how it is that so many white conservative Protestants (sometimes called “evangelicals”) voted for the current President. Yet, there is something new happening with the “court prophets” as Fea calls the leaders of the 2.0 version of the religious right. Believe Me is a fair and fascinating study of what’s going on in these contentious times and helps those who are not part of the conservative Christian movement understand their fellow citizens. And, hopefully, it will help some who have been too supportive of the current leadership ask if their faith might call them to be less cozy with any political party. 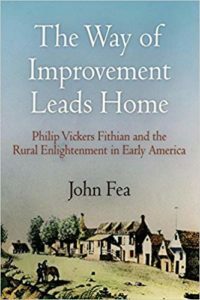 Dr. Fea is a good man, a jovial speaker, a fine scholar, and his book is an important contribution to one of the most important phenomena of our time. 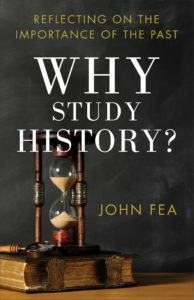 Author John Fea will be speaking at Hearts & Minds, 234 East Main Street in Dallastown, on August 10th at 7:00 pm. All are invited. Believe Me: The Evangelical Road to Donald Trump (Eerdmans) $24.99 This, of course, is the new release that Dr. Fea has been researching for the last year or so. We are thrilled to have recommended it early on and appreciate Fea’s concern that many of the religious leaders who support President Trump are theologically muddled and that too many citizens are driven by concerns (fear? nostalgia?) that are not healthy or faithful. Regardless of your view of the religious right or the current President, this is a fine work, offering an evangelical historian’s assessment of these peculiar days in which we live. Why Study History? : Reflecting on the Importance of the Past (Baker Academic) $20.00 This slim volume is worth its weight in gold, ideal not only for history majors or younger students but for any of us that need reminded of the importance and value of the study of history. And my, oh my, we all need that reminder in this postmodern era that seems to glory only in the “right now.” That professor Fea brings a particularly Christian slant to his fine essay makes it that much more useful for many. What a great, great little book. Very highly recommended for one and all. Was America Founded as a Christian Nation? 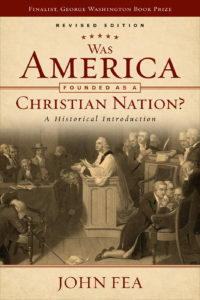 An Historical Introduction (Westminster/John Knox) $30.00 This fabulous and important work was a finalist in the prestigious George Washington Book Prize and is considered by some to be the best (and most evenhanded, insightful) book on the question. It is one of Dr. Fea’s great accomplishments and is respected even by scholars who may have wished for a different emphasis here or there. It’s a live question, and an important matter, and is very highly recommended. 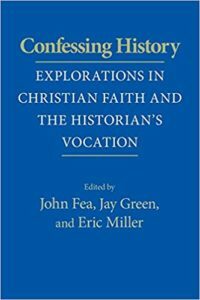 Confessing History: Explorations in Christian Faith and the Historian’s Vocation (University of Notre Dame Press) $40.00 This was co-edited by John with two other exceptional evangelical historians on the notion of the call to be a Christian scholar and professor and the nature of Christian historiography. In a way, Jay Green (of Covenant College) and Eric Miller (of Geneva College) and Fea (of Messiah College) and the others who contributed to this volume represent a newer generation of historians who were informed decisively by the groundbreaking work and reputation of the likes of Mark Noll, Nathan Hatch, and George Marsden.